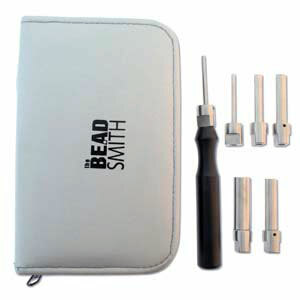 Use the Multi-Mandrel to create uniquely shaped jump rings, toggles, pendants, earrings, and other jewelry items. Finally, high quality ring mandrels with matched size metal ring gauges! Top quality 12.5 inch steel mandrels. Hard anodized alumnium will last a lifetime of use! Hollow ring sticks are perfect for measuring rings 1 to 15 in quarter sizes by US standards. Gauge shows the length of material needed to make specific sizes of rings. Nickel-plated with wood handles. 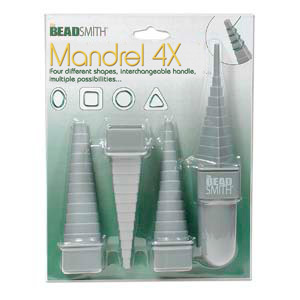 *Grooved mandrels prevent flat bottom bezel settings from interfering with sizing & shaping. custom designed to match the above ring mandrels. Similar in design to the above metal version. MANDREL REST for 11+ inch long mandrels. Cast Steel - Powder Coat Finish - Can be secured to bench top. standard ring mandrels and bracelet mandrels without a tang. Sizes 16 through 20. Marked with Sizes. No Groove. Has a large flat tang the same size as most wood bench pins. Bench pin/anvil combos can be found on our Bench Tools & Equipment page. 7" long plus 1-3/4" long tang. Four round segments. 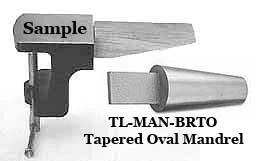 Diameters include 1-3/4", 2", 2-1/4"and 2-1/2"
Large square vise tang is 1-3/4" long, 1-1/2" wide, and 1" thick. Mount on a heavy bench vise. 7" long plus 1-3/4" long tang. Four oval segments. Shapes child's through man sized bracelets.